It is reported in India that the Dalai Lama has criticized the Indian education system. He claimed that the Indian curriculum is too focused on secular subjects and neglecting India’s spiritual and religious heritage. The widely respected spiritual leader claims that India is losing out by focusing on an education system that seeks to provide only for the material needs of its students and not their spiritual needs. The Dalai Lama’s remarks raise questions about the future direction of Indian society. The Dalai Lama is the spiritual head of Gelug Buddhism and regarded as the de-facto leader of the Tibetan people. He is regarded as the reincarnation of a Bodhisattva, that is one who has attained enlightenment for the good of the people. The Dalai Lama is the 14 th reincarnation of the Bodhisattva and embodies the values and ideals of Buddhism for believers in Tibet and beyond. Until the 1950s, Tibet was a theocratic state headed by the Dalai Lama. However, the Chinese Communists claimed Tibet to be an integral part of China and invaded the region and have occupied it ever since. The Dalai Lama was forced to flee to India where he has remained. He is regarded as a very important spiritual figure and peacefully agitates for more political and religious freedom for Tibetans who have been persecuted by the communists. At present, the Chinese Communist Party is trying to select his successor in a bid to control Tibetan Buddhism and to strengthen their hold of the region and its people. Mummified Remains of Monk, Still in Lotus Position, Found in Mongolia - Some Claim He Was Alive! In a speech to young people organized by the Vidyaloke Talks in Bengaluru, the Dalai Lama has condemned what he has seen as the move towards a materialistic society in India. He claims that the education system is only providing students with the means to make a living and to earn money and not to be full-rounded and spiritual beings. He has urged the Indian government according to the New Indian Express, ‘to incorporate its ancient knowledge in the academic curriculum and teach students how to tackle their emotions’. The Dalai Lama believes that India’s rich spiritual heritage is one that can help young people to have more courage and compassion. The spiritual leader of the Tibetan people believes that compassion is essential for the wellbeing of people and the future of the world. Compassion is central to Buddhist philosophy. The 83-year-old spiritual leader stated that India is the home of a great religious and spiritual tradition. This includes Hinduism, Buddhism, Jainism and other religions whose ideas have been immensely influential. The Dalai Lama believes that the study of ancient religious beliefs can transform young people and give them more compassion and the courage that they need to enjoy inner peace. The Deccan Times , reports that the Tibetan also argued that ‘Indian yoga practices can be used to build a healthy body’. The Dalai Lama believes that if the education system returns to an emphasis on the ancient religious texts, that date back over three millennia, along with modern subjects, that it could change India’s role in the world. The Tibetan leader claimed that this will help to make India a model country that inspires others in Asia and beyond. He argued at the talk that India’s ‘ancient wisdom can help to bring in peace and order in a world that is going through a crisis, including in leadership’ according to the New Indian Times. The wisdom of Indian religions can be taught to other nations and this can help to resolve many of the world’s problems, he also claimed. The speech by the exiled Tibetan spiritual leader may be controversial as he is not an Indian citizen. 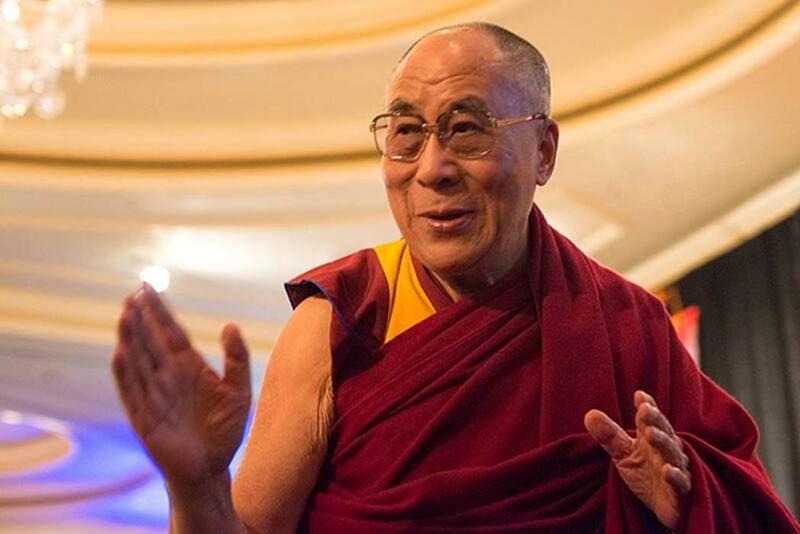 The Dalai Lama is not afraid of raising controversial issues, as he believes that he is morally obliged to promote non-violence and social harmony. In the past, he has called for the abolition of the caste system , which is based on ancient Hindu beliefs. The caste system has created a social hierarchy in many parts of India that discriminate’s against some groups such as the Dalits and imposes various restrictions on an individual’s behavior. The speech by the Dalai Lama is one that reminds Indians of their heritage and how they can use it for their own benefit and for the world. The spiritual leader of the Tibetans believes that spiritual values are superior to materialism and that they can transform the lives of young people and encourage peaceful co-existence around the globe. However, it seems unlikely that the current government committed to the development of India will pay much heed to the Dalai Lama’s calls.